Voted among the best Delis in Southern California by KTLA Channel 5. check it out! Welcome to our website. For over 30 years we've proudly served Apple Valley, Victorville, Hesperia and the entire Victor Valley. Our Meat Shop is filled with gourmet cuts of meat , all Natural with no added hormones, steroids or antibiotics. In addition we carry Free Range Poultry and Seafood of all types. Freezer Meat Packs can be prepared and flash frozen to your specifications. Gift certificates are available for giving friends, family or business assocoiates. In addition to our USDA Prime Grade Meats we are proud to announce that we've just added a wide variety of Seafood. Fresh Norwegian Wild Salmon, Swordfish, Sushi Grade Ahi as well as Lobster tails and Scallops and more. We're pleased to feature our delicious boneless Honey Ham as well as Lamb from New Zealand and Pork chops, roasts and ribs. We are now making our own in-house Jalapeno bacon and Artisan Bacon, wonderfully cured and Hickory smoked with low salt. Come in and check out our Meat Shop today! Overland's Delicatessen, recently voted by KTLA viewers as one of the best delis in Southern California features mouthwatering sandwiches made to order. 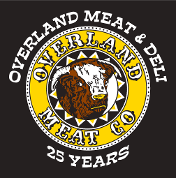 Voted Best Of The Desert every year by the Daily Press, Overland's Delicatessen also features the "best" Pastrami sandwiches, homemade soups, salads and the highest quality deli meats and cheeses. Come in and see our selection of over 100 Import and Microbrew Beers from around the world. Be sure to schedule holiday catering for your home or office. Our Deli takes great pride in our beautifully arranged platters as well as economically priced meal packages to make your event special. 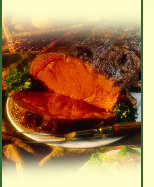 Please refer to our holiday catering brochure on this web site. Overland's Catering services has a reputation throughout the Victorville area of high quality selections as well as dependability. For 30 years we've successfully offered deliciously prepared catering at do-it-yourself prices. Serving from 15-200 guests we offer complete buffet hot meals using the quality meats from our Meat shop to party platters from our Delicatessen, we do it all with that special attention to detail. Delivery and set-up available.